If you’re from West Point, Mississippi, you may be interested in participating in WPHS multi-class reunion on Friday, October 26. Gene Hawkins, class of 1970 won First place in Guri Dam Best Damn Chile Cook Off held in 1979 at Guri Dam , Venezuela and Second Place Black Rock Desert, Nevada Chile Contest 1997. He also won First Place in Cajone, Peru Chile and Steak Contest and Third Place in Kiewit/Bibb Engineering Chile Cook Off 2006. Annie Goodson Fry, class of 1959 can top that. She won the World’s Messiest Cook in Paris in 2005 (that would be Paris, TN). She won “The Girl Most Likely to Eat All the Tea Cakes contest in 2006 and many other kudos she is too timid to share. She is well known throughout the Point as one of, if not The Best cook. The thing is, I think Gene actually won all those competitions. I thought it was a joke then Gary and I googled and found the Kiewit/Bibb thing actually exists. I must call him and apologize for my sarcastic reply to his credentials!!! OK, all you other Chili Heads, here’s the deal…. THERE IS NO ENTRY FEE FOR CHILI COOKERS AND YOU GET IN THE PARTY FREE!!!!! The rules are outlined below. Ya’ll read this real careful now. Cookers must file an Entry Form with Emily Jones or Norma Atkins to reserve a spot for your pot. 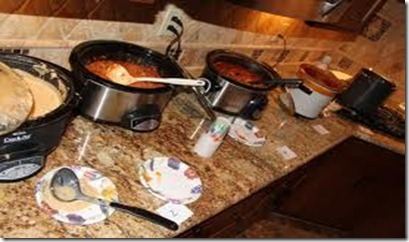 Bring your chili in a crock pot along with an extension cord and a ladle or big spoon. All chili cookers should be at Teen Town at 5:30 p.m.and judging will begin at 5:45 p.m. for best overall chili. All preparation for the cook-off should be done before you arrive. We will provide drinks, crackers, and condiments such as cheese and sour cream. After formal judging guests will be able to enjoy the various recipes and vote on the people’s choice award. Bribes are allowed. All chilli cookers are encouraged to ridicule and otherwise harass other cookers in an attempt to make them cry. Junior high behavior is encouraged. Please make sure all ingredients are edible. If ya’ll can’t understand the above, contact Norma (natkins8237@gmail.com) or Emily (e_bjones@yahoo.com). There ain’t no more rules! Entry information — just send this information to one of the above e-mail addresses. Your Credit Card number – nah just kidding…. That’s it. Please get it in as soon as possible so we can make arrangements for ample paper products and tables. This entry was posted in Boomerang & the old gang and tagged Chili Bash and Monster Mash, Rules for chili competition, West Point High School reunion for all classes by Emily Jones. Bookmark the permalink. Hey Gene, I know where Emily lives.